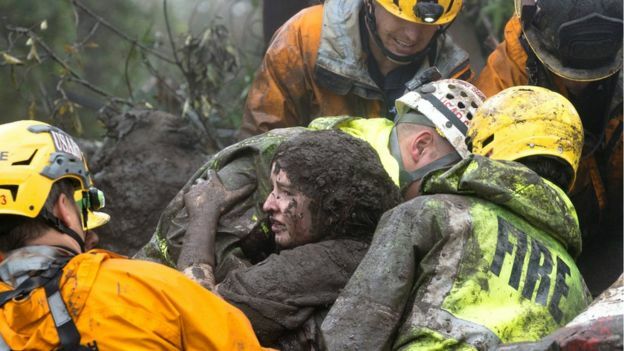 Rescue workers in southern California are searching for survivors after mudslides and flooding in which at least 13 people have died. More than 30 miles (48km) of the main coastal road have been closed and police said the scene “looked like a World War One battlefield”. A group of 300 people are reportedly trapped in Romero Canyon neighbourhood east of Santa Barbara, with rescue efforts due to resume at daybreak. Some 163 people have been taken to hospital. Twenty had “storm-related injuries” and four were critically hurt. The first rain in months caused mudslides when it hit ground that had been scorched by December’s huge wildfires. The Federal Emergency Management Agency (FEMA) says the risk of flooding stays “significantly higher” for up to five years after a wildfire. “Recent burn areas will be especially vulnerable where dangerous mud and debris flows are possible,” said the National Weather Service in a statement. 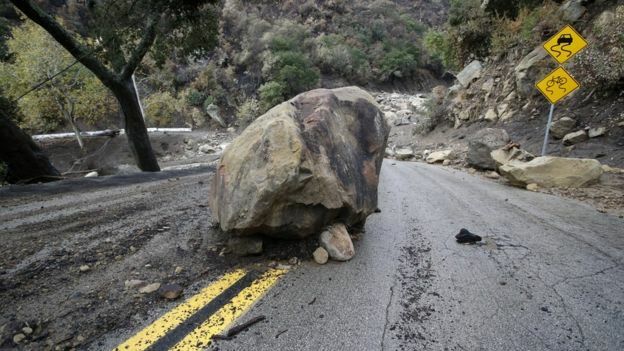 Boulders the size of small cars were rolling down hillsides and blocking roads, reports the BBC’s Los Angeles correspondent James Cook. The upmarket neighbourhood includes homes owned by celebrities such as actor Rob Lowe, chat show host Ellen DeGeneres and broadcaster Oprah Winfrey.